In my previous post, I featured the rare Cicindela highlandensis (Highlands Tiger Beetle), restricted entirely to sand scrubland and pine woodland habitats along the Lake Wales Ridge in central Florida (Choate 2003). 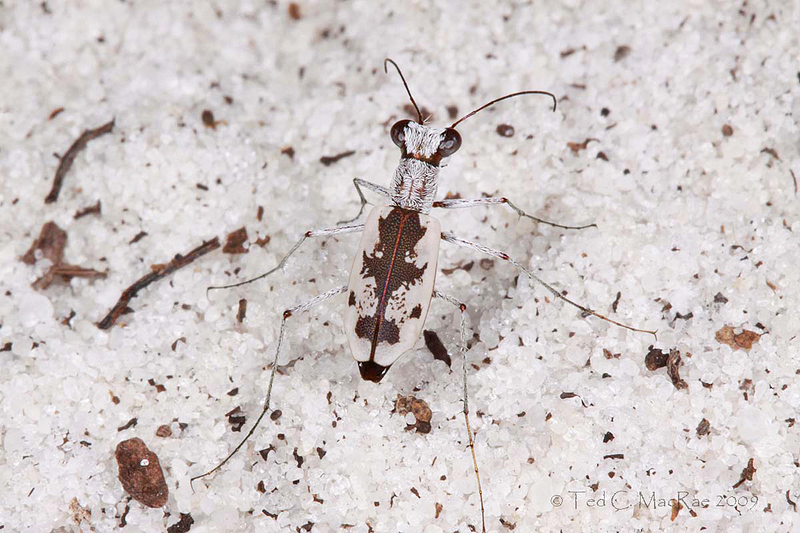 However, that would not be the only Florida endemic tiger beetle that I would encounter during my early August visit. Another of the several tiger beetle species that I’d hoped to see would also be found that day, although in much lower numbers. Ellipsoptera hirtilabris (Moustached Tiger Beetle) is so named¹ because of the dense covering of prostrate hairs on its labrum that distinguish it from the closely related E. gratiosa (Whitish Tiger Beetle). Both of these species exhibit striking white maculations that cover almost the entire elytral surface and dense white pubescence covering the head, thorax, underside and legs. They are the only species of the genus occurring in Florida, but their ranges do not overlap (Pearson et al. 2006)—E. gratiosa occurs in the coastal pine barrens of Virginia, the Carolinas, southern Georgia and the Florida panhandle, while E. hirtilabris is restricted to peninsular Florida in pine woodlands, sand hills and other habitats with open white sand. Although the latter is considered a Florida endemic, it has been found just outside of Florida in extreme southeastern Georgia on St. Simon’s Island (Choate 2003). In addition to the pubescence of the labrum and their allopatric distributions, the two species may further be distinguished by the slightly less expanded markings and more diffuse edges where they contact the central bronze area in E. hirtilabris and the slightly larger size of E. gratiosa. 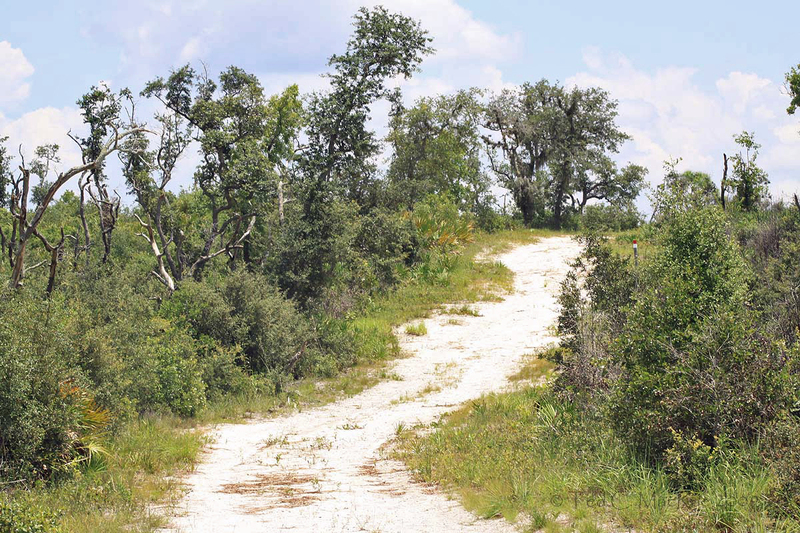 Like C. highlandensis and C. abdominalis, it seems likely that E. hirtilabris and E. gratiosa evolved from a common ancestor, diverging in isolation from each other during the pre-Pleistocene separation of peninsular Florida from the North American mainland. ¹ The species epithet is derived from the Latin words hirtum meaning “hairy” and labrum meaning “lip”. I found E. hirtilabris to be exceedingly difficult to see and photograph. 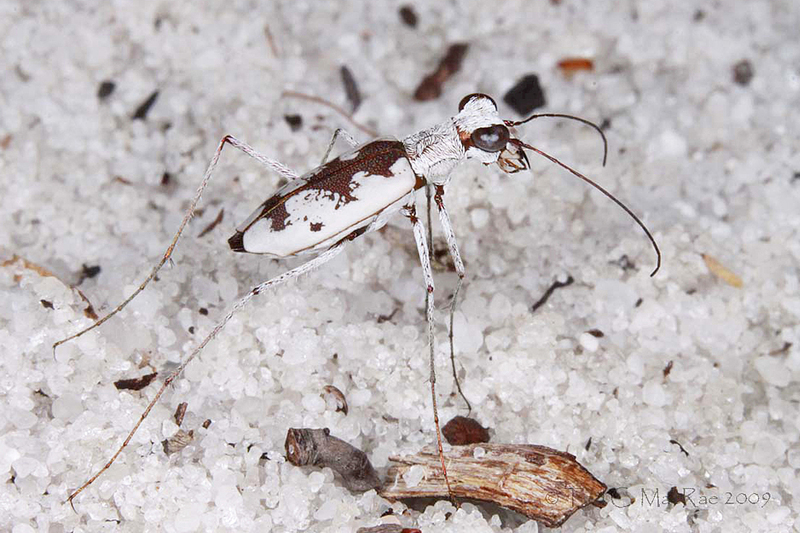 Unlike C. highlandensis, which resemble bits of debris laying on the surface of the white sands where it lives, the largely white E. hirtilabris blend into the white sand itself and are almost impossible to see until they move. The small bronze-colored patches along the elytral suture augment their cryptic capabilities by resembling small bits of debris, which is especially evident in the photo below. Both Pearson et al. (2006) and Erwin and Pearson (2008) state that adults of this species freeze in position when approached, which may be the reason why I saw so few individuals. Once I did see them, they were extremely wary and difficult to photograph no matter how cautiously I approached. The photos shown here represent the only two individuals that I succeeded in photographing, and in neither case did I succeed in getting a frontal perspective to show the pubescent labrum (stifling heat and oppressive humidity during the photo session did not help matters, either). Photo 1: Canon 100mm macro lens on Canon 50D (landscape mode) ISO-100, 1/250 sec, f/16, natural light. Photos 2 & 3: Manual mode, f/25, MT-24EX flash w/ Sto-Fen diffusers @ 1/8 ratio. This entry was posted in Cicindelidae, Coleoptera and tagged beetles, crypsis, entomology, Florida, insects, landscapes, nature, science, scrub, taxonomy, tiger beetles. Bookmark the permalink. Wow… The photos are fantastic and the beetles are stunning, but it’s quite obvious how difficult it would be to see one of these. Their camouflage is amazing. Great find! Hi Jason. Your kind comments about the photos are greatly appreciated, but truth be told I was not very happy with them. I had limited opportunity to get the lighting levels worked out properly and ended up erring on the dark side. They look pretty good after brightening them up a tad in PhotoShop, but I’m finding myself becoming really critical of my photos if I don’t get the lighting right out in the field to begin with. Despite the difficulties in photographing under harsh conditions, there is a gratifying element to overcoming obstacles to get the shot! Thanks, Geek – striking indeed! Nice story and photos. I was looking for this species a couple of weeks back when I was in Florida, but it was not to be. I may have been too late for their flight period. They remind me of C. lepida, which is similarly difficult to see. Yes, finding them reminded me very much of the first time I found E. lepida – another species I need to relocate for photographs! I agree completely, and thank you! One of our favorite things about coming to your site is that we always find ourselves amazed at how beautiful these beetles are. We always seem to think — “this one has GOT to be the world’s most gorgeous beetle!” Then we visit again and think the same thing about the next beetle! Now our list of ‘the world’s most gorgeous beetle’ is getting pretty big. This one simply has to take the cake. Not only is it nearly invisible — spotting one must be great fun — but its colors are so striking that we just couldn’t take our eyes off it. Thanks, K&R. I can see that you “get it” – the reasons behind my passion for these beetles. Add exquisite variety and “behavioral charisma” to their stunning looks, and you have the makings of an endlessly fascinating group! As you mentioned above, I could hardly get over how fantastic gratiosa is but hirtilabris is clearly just a striking. The second picture did a great job of capturing the superb cryptic coloration of the beetle relative to the substrate. Really nice pic. I don’t have that shot of gratiosa but I’ll certainly try to get it next time. Did you need to compensate the exposure (i.e., close up or reduce the flash power) with that bright background? Hi Chris – thanks. I didn’t think it was such a great shot because of the angle until I got it on the computer and saw how nicely it illustrated the cryptic coloration. One of these days I’ll take a good picture on purpose instead of by accident! Yes, I had to close up (f/25) and reduce the flash (1/8 power with the diffusers, which equals 1/16 power without). I actually overshot it a little bit and had to brighten a tad in Photoshop – with all that white sand on a sunny day I was really concerned about overblowing all my shots.